Boasting high print quality and fast print speeds in a compact design, the ZXP Series 1 single-sided ID Solution is ideal for applications that require high-quality cards. It's a powerful, feature-rich card printer, yet it's also affordably priced. The Zebra ZXP Series 1 single-sided printer comes with a 2-year warranty that includes the printhead. The Zebra ZXP Series 1 single-sided card solution is compact, making it easy to transport or fit in a small workstation. 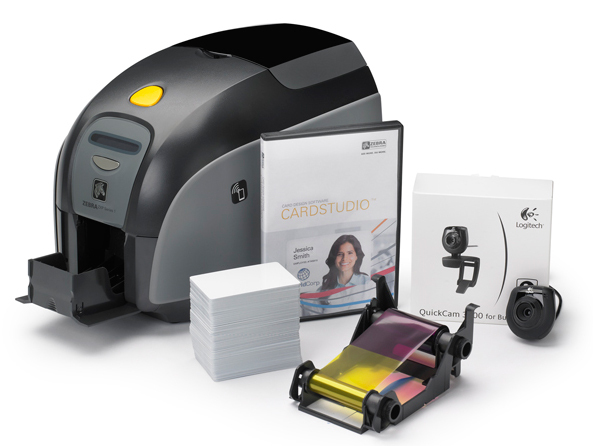 Very little training is required to operate the Zebra ZXP Series 1 with cartridge-based ribbons and an easy-to-read LCD display, you'll be printing cards in no time! You can also easily create one-off cards with the built-in single-card feeder. » Print quality ID cards - fast! The Zebra ZXP Series 1 single-sided card printer creates photo-quality images, fast! Zebra's Zraster™, a host-based image processing technology, enables fast print speeds and high quality images. It also prints in landscape mode for even greater efficiency and speed. Simply drop in your ribbon and print! Zebra's Load-n-Go™ printer ribbons are easy-to-use and designed for high print speeds and high quality printing. To ensure a smooth performance, the Zebra Series 1 single-sided printer auto-calibrates the ribbon. The Zebra ZXP Series 1 Single-Sided QuikCard System offers the option to upgrade to magnetic encoding. ID Zone offers extended warranty plans with satisfaction-guaranteed service handled by our in-house, knowledgeable technical support team. Our extended warranty plans include support via a toll-free number or live chat, total parts replacement plus labor, and fast turn-around on printer repairs. In the event your printer needs to be sent to us for repair, our loaner plans help ensure your card printing can continue. With printer loaner coverage, we'll send you a loaner printer to use while yours is in for repair. Capturing quality images is simple and efficient with the easy-to-install and use web camera included with theSingle-sided ZXP S1 QuikCard System. Your QuikCard System includes ribbon and cards for printing up to 200 ID badges.